Meditation or concentration. Mokuso can be performed sitting or standing. It merely represents the concentrated mind. 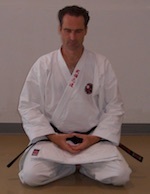 Here Shihan Henderson is performing Mokuso in Seiza, formal sitting position. While in Mokuso many practitioners concentrate or focus on breathing. Deep inhalations through the nose into the Hara, lower part of the lungs, for 3 seconds followed by long exhalations from the mouth for 3 seconds. Others breath deeply but normally while concentrating on a Koan or visualizing their kata being performed in their mind’s eye.